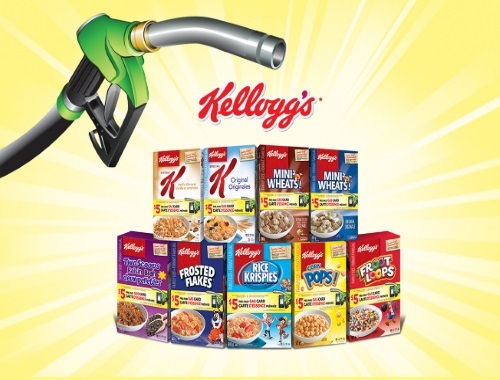 The Kellogg's $5 Gas Card promo is back! Get a $5 Pre-Paid Gas Card when you purchase two specially-marked boxes of Kellogg’s cereal! 1) Buy any two specially-marked boxes of Kellogg’s* cereal on one receipt between July 6, 2017 & September 30, 2017. 2) Snap a photo of the receipt showing the two qualifying purchases and SEND it by text or by email to kelloggs@drvs.ca for validation before October 15, 2017. 3) Receive a reply with a unique PIN Code and instructions on how to receive your $5 Pre-Paid Gas Card. PIN Codes must be used by October 31, 2017. 4) Activate your Pre-Paid Gas Card by phone or online and redeem it at any Canadian gas retailer that accepts major Pre-Paid gift cards. Limit of five (5) Pre-paid Paid Gas cards per household. PIN Codes must be redeemed by October 31, 2017. PIN Codes cannot be redeemed more than once. Allow approximately 6-8 weeks from the time that the Pre-Paid Gas Card is claimed, to receive your $5 Pre-Paid Gas Card in the mail. Pre-paid Paid Gas Card expires January 31, 2018. Pre-paid Paid Gas Card must be activated by phone or online.